Jane and I visited the Porch Museum in Godmanchester yesterday to see a beautiful young juvenile Woolly mammoth tusk. Curator Kate Hadley of the Porch museum had alerted me to the fact that the lucky finder was bringing it along again with her proud children. The Norris Museum was visiting the Porch museum with many displays and activities for the day, so it was a lively event. I'd seen this tusk over a year ago and so it was great to be able to get a second chance to look at this beautiful tusk, kept by the finder family. The tusk is about 60 cm long and has an intact root, which is the quarter or more of the tusk within the jaw of the animal and the end at which growth occurs. 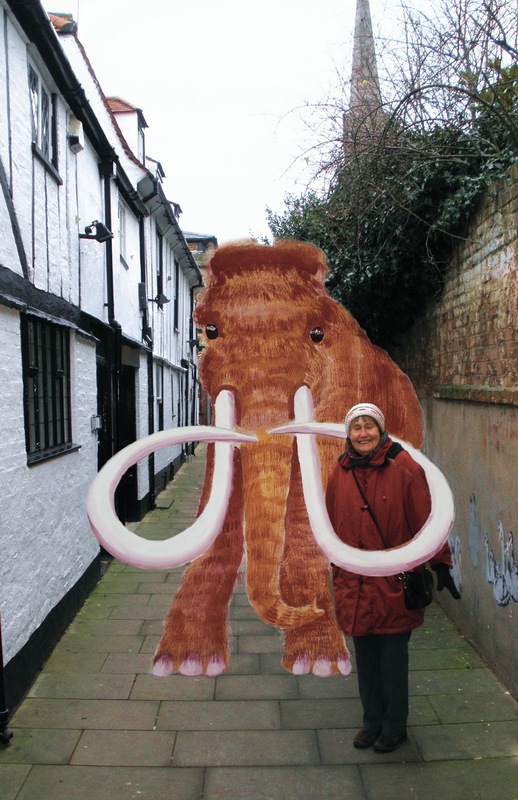 With mammoths, growth of the tusk was between 2.5 cm to 17 cm per year, suggesting that the tusk from this individual was about 4 years old. Looking along the curve, you could see the gentle tendency to spiral so typical for Mammoths. Examining the layers of dentine at the root end, some were thick enough to see the criss-crossing pattern in cross-section, called 'engine turning'. In this tusk, the pattern had the more acute angle typical of mammoth ivory, compared to elephant ivory, as I was able to demonstrate to the Mayor of Godmanchester. This being the second time we had met within a week as he also stopped to chat with us at the HBN stand at the Wood Green business fair last Wednesday. I filmed an impromptu interview of Hannah from the Norris and also videod curator Kate plus two volunteers from the Porch Museum. The edited recordings can be found in the on YouTube in my new playlist, Museum Talks https://www.youtube.com/playlist?list=PLO_a6a_qHNAXlTqjWnGlmRc5bWQlA0ZHn. Apologies for the background noise - people were having fun, and we would rather have it like this in our museums.